Enjoy a luxurious South African safari in style at this multi-award-winning safari lodge, located in the game-rich Sabi Sands Game Reserve. See an Ultimate Extravagance Safari Package based on this safari lodge. 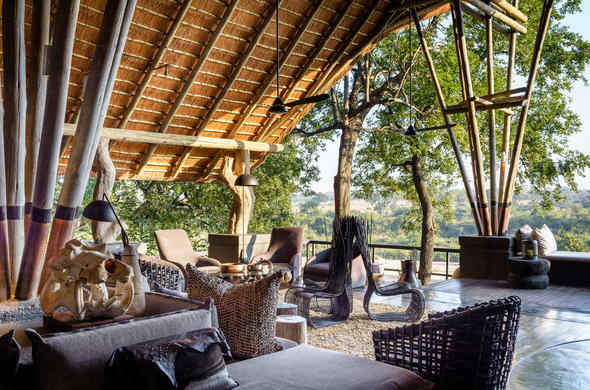 What sets this Sabi Sand safari lodge apart? Fantastic wildlife, a great wine cellar and a range of great outdoor activities are what make staying here an unforgettable experience for the discerning safari traveller. The lodge offers guests a sophisticated and luxurious safari experience for those who enjoy the finer things in life. There is an intimate feel with just 12 luxurious suites, each with their own lounge, private deck and plunge pool. You can enjoy exciting morning game drives on which you might spot the Big Five, or experience bush life while on guided walks accompanied by an expert guide. Alternatively you can go cycling through the bush pathways or test your aim with a round of archery. Afterwards you can cool off with a dip in your private plunge pool, or savour a relaxing treatment at the spa. Wine connoisseurs will appreciate the spectacular bush cellar boasting exclusive wine tasting accompanied by delicious African inspired gourmet food, specially prepared by the chefs.